HogwartsProfessor discussed ‘The Hanged Man’ back in 2007 in response to postings at my BarnesandNoble.com classroom site. Those postings were taken down many years ago so the links at the post no longer work; I found what is almost certainly the same writer’s work, however, in the archives of the Chamber of Secrets forum discussion boards. Hats off to the first serious reader to make note of the importance of ‘The Hanged Man,’ whoever ‘Bscorp’ may be. Let’s try to put the references in reverse order of clarity and strength. 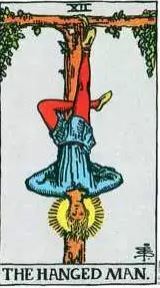 The more obscure pointers to ‘The Hanged Man’ tarot card are the several occasions in which characters play the “paper and pencil guessing game” Hangman. Today, they suffered an hour and a half’s droning on the subject of giant wars. Harry heard just enough within the first ten minutes to appreciate dimly that in another teacher’s hands this subject might have been mildly interesting, but then his brain disengaged, and he spent the remaining hour and twenty minutes playing hangman on a corner of his parchment with Ron, while Hermione shot them filthy looks out of the corner of her eye. A space cleared in the crowd, and Harry pushed his way toward the counter, where a gaggle of delighted ten-year-olds was watching a tiny little wooden man slowly ascending the steps to a real set of gallows, both perched on a box that read: REUSABLE HANGMAN — SPELL IT OR HE’LL SWING! There is the ‘Hand of Glory,’ for one thing, which Draco purchases and puts to use in Half-Blood Prince. The ‘Hand of Glory’ traditionally is the left hand of a hanged man. As if to underline this link, Draco takes a good look immediately after this at a rope before ogling the cursed necklace he also uses in Half-Blood Prince. Rowling specifies that it is “a hangman’s rope,” which might have gone without saying in this retail venue. Harry watched nervously as Draco drew nearer and nearer to his hiding place, examining the objects for sale. Draco paused to examine a long coil of hangman’s rope and to read, smirking, the card propped on a magnificent necklace of opals, Caution: Do Not Touch. 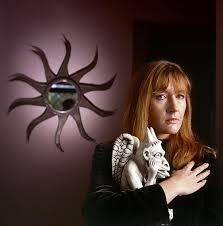 Cursed – Has Claimed the Lives of Nineteen Muggle Owners to Date. How about people and animals hanging by the neck, by the ankle as in ‘The Hanged Man’ tarot card, or by any other appendage? “What’s that thing – hanging underneath?” said Ron, a slight quiver in his voice. As they edged nearer, Harry almost slipped – there was a large puddle of water on the floor; Ron and Hermione grabbed him, and they inched toward the message, eyes fixed on a dark shadow beneath it. All three of them realized what it was at once, and leapt backward with a splash..Mrs. Norris, the caretaker’s cat, was hanging by her tail from the torch bracket. She was stiff as a board, her eyes wide and staring. Harry looked desperately around. Black and Lupin both gone… they had no one but Snape for company, still hanging, unconscious, in midair. Goblet of Fire is a gold mine of hanging, as we’ll see, that point to ‘The Hanged Man.’ In terms of people hanging, though? How about those floating Muggles suspended upside down by the Death Eaters? In case we didn’t recall this ourselves, when Harry tries out the Prine’s nonverbal Levicorpus spell and Hermione disapproves, she suggests the Black Hats in Goblet used this against the Muggle campground keepers (Prince, ch 12, p 241). The world turned upside down. Harry was hanging from the ground, with his hair on end, his glasses dangling off his nose, threatening to fall into the bottomless sky. He clutched them to the end of his nose and hung there, terrified. It felt as though his feet were glued to the grass, which had now become the ceiling. Below him the dark, star-spangled heavens stretched endlessly. He felt as though if he tried to move one of his feet, he would fall away from the earth completely. Think, he told himself, as all the blood rushed to his head, think. . . But not one of the spells he had practiced had been designed to combat a sudden reversal of ground and sky. Did he dare move his foot? He could hear the blood pounding in his ears. He had two choices – try and move, or send up red sparks, and get rescued and disqualified from the task. He shut his eyes, so he wouldn’t be able to see the view of endless space below him, and pulled his right foot as hard as he could away from the grassy ceiling. Immediately, the world righted itself. Harry fell forward onto his knees onto the wonderfully solid ground. He felt temporarily limp with shock. He took a deep, steadying breath, then got up again and hurried forward, looking back over his shoulder as he ran away from the golden mist, which twinkled innocently at him in the moonlight. But it was no use – the spider was either so large, or so magical, that the spells were doing no more than aggravating it. Harry had one horrifying glimpse of eight shining black eyes and razor-sharp pincers before it was upon him. He was lifted into the air in its front legs; struggling madly, he tried to kick it; his leg connected with the pincers and next moment he was in excruciating pain. He could hear Cedric yelling “Stupefy!” too, but his spell had no more effect than Harry’s – Harry raised his wand as the spider opened its pincers once more and shouted “Expelliarmus!” It worked – the Disarming Spell made the spider drop him, but that meant that Harry fell twelve feet onto his already injured leg, which crumpled beneath him. Without pausing to think, he aimed high at the spider’s underbelly, as he had done with the skrewt, and shouted “Stupefy!”just as Cedric yelled the same thing. The two spells combined did what one alone had not: The spider keeled over sideways, flattening a nearby hedge, and strewing the path with a tangle of hairy legs. And then it was gone. He was hanging limply in the ropes binding him to the headstone of Voldemort’s father, looking up into those bright red eyes through a kind of mist. The night was ringing with the sound of the Death Eaters’ laughter. ‘I wouldn’t go out with you if it was a choice between you and the giant squid,’ said Lily. But too late; Snape had directed his wand straight at James; there was a flash of light and a gash appeared on the side of James’s face, spattering his robes with blood. James whirled about: a second flash of light later, Snape was hanging upside-down in the air, his robes falling over his head to reveal skinny, pallid legs and a pair of greying underpants. “You mean he is a bully?” asked Dumbledore. Dumbledore did not press her, though Harry could tell that he was interested. She took yet another gulp of gin and her rosy cheeks grew rosier still. “I shouldn’t think so, no,” said Dumbledore quietly. “AHA!” screamed a voice from overhead and both of them jumped; unnoticed by either of them, they had just passed underneath Peeves, who was hanging upside down from a chandelier and grinning maliciously at them. The drawing room was full of silent people, sitting at a long and ornate table. The room’s usual furniture had been pushed carelessly up against the walls. Illumination came from a roaring fire beneath a handsome marble mantelpiece surmounted by a gilded mirror. Snape and Yaxley lingered for a moment on the threshold. As their eyes grew accustomed to the lack of light they were drawn upwards to the strangest feature of the scene: an apparently unconscious human figure hanging upside down over the table, revolving slowly as if suspended by an invisible rope, and reflected in the mirror and in the bare, polished surface of the table below. None of the people seated underneath this singular sight was looking at it except for a pale young man sitting almost directly below it. He seemed unable to prevent himself from glancing upwards every minute or so. Harry’s voice was high, clear and cold: his wand held in front of him by a long-fingered, white hand. The man at whom he was pointing was suspended upside down in mid-air, though there were no ropes holding him; he swung there, invisibly and eerily bound, his limbs wrapped about him, his terrified face, on a level with Harry’s, ruddy due to the blood that had rushed to his head. He had pure white hair and a thick, bushy beard: a trussed-up Father Christmas. And then there is the much more specific ‘Hanged Man’ effect of the Levicorpus spell. Harry turned to leave; he had got two steps towards the door when a crashing blow hit him on the right ear. Staggering, he looked round. Ron’s fist was drawn right back, his face was contorted with rage; he was about to strike again. ‘What was that for?’ Harry bellowed. Enough? I’m guessing you recall that the pub in Little Hangleton in which Fred Bryce is convicted and crucified figuratively by his neighbors for the murder of the Riddle family is called ‘The Hanged Man.’ It isn’t described, but I’m guessing the pub sign is of the tarot card. And the town’s name comes up again in the finish because faux Moody’s portkey transports Harry and Cedric to the Little Hangleton graveyard. Did I mention that Lethal White, the fourth book of the Cormoran Strike series, gives a hanged man and gallows making a central place in that mystery? Not in my two posts on the Goblet-Lethal links I didn’t! See here and here. Images of ‘The Hanged Man’ permeate Harry’s adventures, and though Professor Trelawney never mentions the card or figure in her druken Half-Blood Prince ramblings, it is named at the opening of Goblet. Next up, what those who do tarot card readings think this card means. Let me know in the comment boxes below if you can think of Casual Vacancy, Cursed Child, Cormoran Strike, or Harry Potter allusions to the figure that I’ve missed in my list!